October newsletter! We're excited to keep in touch with you regarding our continued growth in fulfilling our mission. 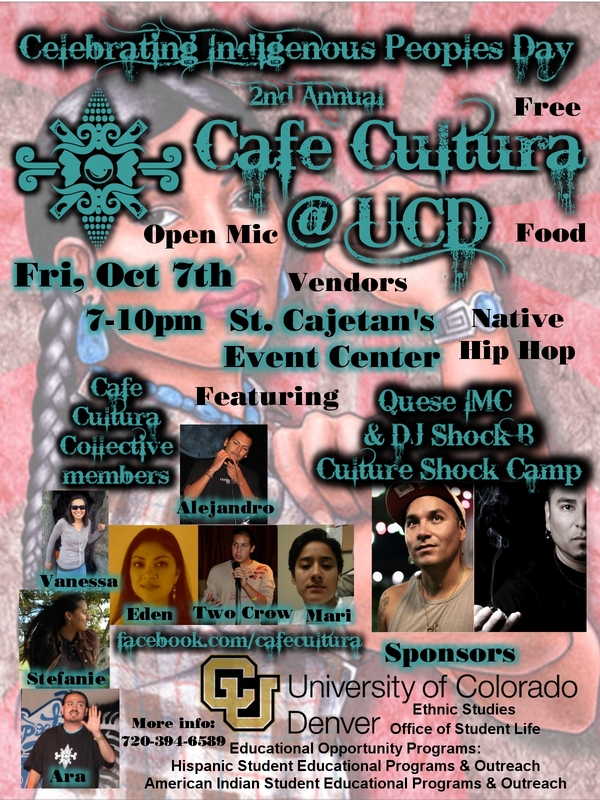 Open mic, Native Hip Hop, free food, vendors, & community! ---->Quese IMC & DJ Shock B - Culture Shock Camp: Consisting of founding members Quese IMC and Indigenius Shock B, Culture Shock Camp has provided invaluable services and entertainment to more than 200 reservations and urban Indian communities, 150 national and regional conferences, 50 universities and colleges, and over 100 cities in the past five years. Quese IMC is an award winning Indigenous (Pawnee/Seminole) Hip Hop artist. DJ Shock B (Pawnee/Seminole) is a highly talented and multi-faceted individual who is best known for his work as a Drug/Alcohol Free Motivational Speaker, "Cultural Activist," Youth Advocate, Performer, DJ, Mentor & Wellness Trainer. Open mic, Native Hip Hop, food for sale (Indian Tacos), vendors, & community! 2nd Friday of Every Month...Everyone is welcome! We are extremely excited about our partnership with KIPP Denver Collegiate High School and The Bridge Project @ Quigg Newton. Throughout the year, we are providing spoken word workshops for participating youth. One series of spoken word/poetry workshops will take place every Wednesday from 6:30 to 8pm at the Bridge Project within the Quigg Newton community (4558 Navajo St). Youth outside that particular community can participate but need to register. We start tonight! Food will be provided. We are asking for consistent attendance @ workshops. Quese IMC & DJ Shock B - Culture Shock Camp will be our guest presenters on Wed, Oct. 12th. In addition, we are conducting our "Xpress Yourself" workshops at Girls, Inc. on Oct. 12th as well as at the LaTEENa conference on Oct. 22nd. Community Speaks Project: As a part of our "Nourishing Seeds of Healing & Empowerment" workshop series, we bring together the finalized poems, lyrics, and/or art from participating youth. The title of each book is specific to the community in question (i.e. Quigg Newton Speaks, Denver Indian Center Speaks, etc). Caf� Cultura in the Community: The last part of the "Nourishing the Seeds of Healing and Empowerment" workshop series includes Caf� Cultura Collective members coaching youth as they practice performing at least one poem in front of an audience. As part of the book release party, the Collective hosts an open mic event for the surrounding community to showcase youth participants, share food, and perform our poetry.